We’d love your help. Let us know what’s wrong with this preview of Thinking About It Only Makes It Worse by David Mitchell. What's wrong with calling a burglar brave? Why are people so f***ing hung up about swearing? Why do the asterisks in that sentence make it okay? Why do so many people want to stop other people doing things, and how can they be stopped from stopping them? Why is every film and TV programme a sequel or a remake? Why are we so reliant on perpetual diversion that someone has created chocolate toothpaste? Is there anything to be done about the Internet? These and many other questions trouble David Mitchell as he delights us with a tour of the absurdities of modern life - from Ryanair to Downton Abbey, sports day to smoking, nuclear weapons to phone etiquette, UKIP to hotdogs made of cats. Funny, provocative and shot through with refreshing amounts of common sense,Thinking About It Only Makes It Worse celebrates and commiserates on the state of things in our not entirely glorious nation. To ask other readers questions about Thinking About It Only Makes It Worse, please sign up. Thinking About It Only Makes It Worse: And Other Lessons From Modern Life is a book by British actor, comedian and writer, David Mitchell. It contains a collection of columns that Mitchell has written for the Observer over the period 2009 to 2014, with some additional commentary. It also includes a twelve page appendix of predictions (made with tongue firmly in cheek) for years to come. Amongst the myriad of subjects on which Mitchell opines, TV shows, ad slogans, elections, wheelie bins and a comparison of GFC bankers with Nazis are just a sample. Although some columns are quite dated, they may still be interesting to most readers, but others are, frankly, boring and readers could not be blamed for skipping pages. Viewers of QI and Would I Lie To You will hear Mitchell’s distinctive voice behind the text. Not for everyone. Drawn from his column in the Observer each week, this collection of articles is diverse and wide ranging. No subject is too big or trivial for Mitchell to consider, from smoking to politics, the nuclear question to chocolate flavoured toothpaste and swearing to Downton Abbey. He asks questions that others won’t like, why do so many people want to stop other people doing things, and how can they be stopped from stopping them? And why are people so obsessed with bin collections? He is not afraid t Drawn from his column in the Observer each week, this collection of articles is diverse and wide ranging. No subject is too big or trivial for Mitchell to consider, from smoking to politics, the nuclear question to chocolate flavoured toothpaste and swearing to Downton Abbey. He asks questions that others won’t like, why do so many people want to stop other people doing things, and how can they be stopped from stopping them? And why are people so obsessed with bin collections? He is not afraid to be controversial too. He agrees with the judge who called a burglar brave, has a liberated view about swearing and bemoans that total lack of common sense that seems to prevail most of the time. •	Some things change and some things stay the same – and that’s one of the things that stays the same. Of course with such wide ranging chapter headings that each contain a plethora of loosely linked articles and the topics make it nigh on impossible to review. There is always going to be some topic that annoys people and other people love, and this is how I found it to be, some left me yawning – others didn’t. I don’t live in the UK – so ALL of these articles are new to me as I don’t read The Observer – however a friend of mine who lives in London complained as he said there was nothing new in the book for him as he avidly reads the columns, so keep that in mind. However, what I DID pick up was that some of the pieces he wrote may have been a bit old, like events happened years ago – and the information no longer as current – so I wasn’t quite as enthralled as I could have been as he didn’t change the tense when he added the pertinent column piece. He could have said that this happened back then, and this is what I thought and then either tells us if there have been any changes and what he thinks now and it would have added a deeper insight. I feel like a traitor for saying I thought just regurgitating his articles was a little bit lazy – he is normally so funny I think he could have pulled a whole new list of the absurdities of modern living to have a go at. I know too that in his introduction Mitchell mentioned that he was going to be complaining about the modern life, but I expected it to be, well, amusing complaining. If not all the time, at the very least some of the time, David Mitchel is a comedian after all – he kept telling us he was a comedian on more than one occasion. But he did do a lot of whinging and I didn’t actually laugh out loud once – whereas I am always cracking up at the things he says on TV – I did smile quite often – and even related to his parents and their Christmas cards. That was me he was writing about too – no card for two years and off the list you go!! But for the most part it just wasn’t as entertaining as I thought it would be. Maybe it was because it is not a book you should really start at the beginning and read through to the end – which I tried not to do – I was happier when I just dipped in and out of it which is maybe what he intended his readers to do. So if you are a fan of David Mitchell by all means pick up THINKING ABOUT IT ONLY MAKES IT WORSE but dabble with it, treat it like a box of chocolates – read a bit here and a bit there rather than inhale the whole lot - your enjoyment will be better. His voice comes through in his writing and I could almost hear him speaking as I read. I love that in a book. C – Above average. Was very readable and I really liked it but was easily able to put it down and walk away for a while. With thanks to Allen & Unwin and the author for this copy to read and review. I unfortunately couldn't finish this one. As much as I like David Mitchell I couldn't get through his articles. I found some humour in them, that I can't bash him for. Though I just found it hrd to sludge through and it is definitely not a book to sit down to read in a couple of sittings, 20 minutes at a time is what's gonna end up happening with this. A collection of humorous newspaper articles written by David Mitchell are reprinted under vaguely ordered chapters. I found a good many laugh out loud moments within the book and plenty more to smile about but there is most certainly a diminishing returns element to all this. The first ten stories are fun and original, the next ten are fun but 3 of them feel like something you read in the first ten. This continues on until by the end of the book the last ten maybe only 1 or 2 have a fresh feel. Th A collection of humorous newspaper articles written by David Mitchell are reprinted under vaguely ordered chapters. The first ten stories are fun and original, the next ten are fun but 3 of them feel like something you read in the first ten. This continues on until by the end of the book the last ten maybe only 1 or 2 have a fresh feel. That is just the way it is. Combine that with my requirement to read the book within a timeframe (back to the library it goes) and it is like eating one chocolate bar after another. I suspect this has meant I have cut off a star from this rating because of the way I read it. There is a lot to like though. David is possibly quite angry but it is the anger that makes those laugh around him. The anger of a middle aged privileged white guy railing about how people called him names because of his "posh" credentials or the fact grammar as he knows it is not used by others. Fortunately David is self-aware enough to know this is funny so he avoids the "get over yourself" tag. Other articles give a fresh new perspective on looking at certain events or attitudes people have. Politicians come in for a pasting which given we are stuck with them regardless of what we do we might as well laugh about how poor they are at doing their jobs. If, like me, you have an inflated opinion of yourself, enjoy listening to BBC Radio Four, and ‘get’ satire, I would strongly recommend that you purchase David Mitchell’s new book, ‘Thinking About It Only Makes It Worse’. The new book features a selection of some of David Mitchell’s best articles written during his time at The Observer from 2008 to 2014. 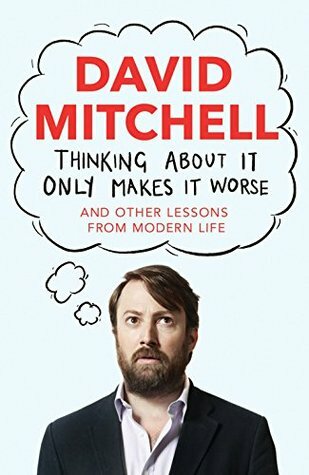 ‘Thinking About It Only Makes It Worse’ offers David Mitchell’s concerns, opinions and possible (although somewhat un Overall rating: 4 out of 5. If, like me, you have an inflated opinion of yourself, enjoy listening to BBC Radio Four, and ‘get’ satire, I would strongly recommend that you purchase David Mitchell’s new book, ‘Thinking About It Only Makes It Worse’. The new book features a selection of some of David Mitchell’s best articles written during his time at The Observer from 2008 to 2014. ‘Thinking About It Only Makes It Worse’ offers David Mitchell’s concerns, opinions and possible (although somewhat unlikely) solutions to, a variety of topics which include The financial crisis, his penchant for daytime TV and even chocolate flavoured toothpaste. As you would expect from a comedian like David Mitchell, with roots in the high-brow world of BBC Four, his articles prove to be both illuminating and an entertaining read. Many of the articles are demonstrative of his formidable intellect, although somehow, even through all the doom and gloom, prophecies and predictions, Mitchell still manages to hang on to his classic sense of humour; and with one well-placed turn of phrase, retains the ability to make you laugh out loud, even when you probably shouldn’t. One of my only criticisms of this book is the fact that it is reminiscent of a Simpson’s clip show, all the material already existed and all that had to be done was group articles together into broad chapters which focus on vaguely similar themes and hey presto, a new book! However David Mitchells rationally argued, well-informed and frequently hilarious articles go quite some way to counterbalance this fact. The book makes for a great overall read, especially for any of his fans; just don’t read the whole thing at once! Comedian David Mitchell is well known thanks to the variety of TV shows such as 'Peep Show' and 'That Mitchell and Webb Look' he can be seen in. As a result, as soon as I saw he had written this book I knew that I wanted to read it. If I'm being completely honest, this book didn't match my original expectations and though it's humerous at times, it's also rather tedious reading at times. I received a free copy of this book by the book's publishers via NetGalley in exchange for an honest review. Comedian David Mitchell is well known thanks to the variety of TV shows such as 'Peep Show' and 'That Mitchell and Webb Look' he can be seen in. As a result, as soon as I saw he had written this book I knew that I wanted to read it. If I'm being completely honest, this book didn't match my original expectations and though it's humerous at times, it's also rather tedious reading at times. The language used meant that if you were wanting a relaxing holiday read, rather having to use a dictionary all of the time, this isn't for you. If it wasn't for the dictionary on my Kindle I wouldn't have been able to make sense of some of his sentences. Let's face it, for me at least, the news is rarely interesting nor exciting. Neither is politics for me. However, they should make an excellent ground for comedy as it's something that everybody hears about. In this instance however, it just didn't work. Other people may thoroughouly enjoy this but it's not something I have any intention of reading again. Thinking About it Only Makes it Worse by David Mitchell is quite possibly the worst book I’ve read this year, although maybe not quite as bad as that Whistleblower book that made me want to strangle the protagonist. I wanted to read this book because I immediately thought I’d get some laughs but mostly I got eye ache from rolling them too much. I honestly don’t even know where to start here, it wasn’t as if the entire book was awful. Half the book was terribly dated because he’d written it years Thinking About it Only Makes it Worse by David Mitchell is quite possibly the worst book I’ve read this year, although maybe not quite as bad as that Whistleblower book that made me want to strangle the protagonist. I wanted to read this book because I immediately thought I’d get some laughs but mostly I got eye ache from rolling them too much. I honestly don’t even know where to start here, it wasn’t as if the entire book was awful. Half the book was terribly dated because he’d written it years ago but he tries to get around his laziness, where he should have written or updated it, by throwing in really bad italicised comments. They’re along the lines of “look how wrong I was, I’m hilarious”. I actually didn't realise before starting this that it was just a collection of newspaper columns. What this means is that it's probably best read in short bursts in the bathroom rather than all in one go. The columns are mostly what you'd expect from Mitchell. Mordant, slightly grumpy and contrarian, but sprightly and often laugh-out-loud funny. One rather heavy section deals with the last election campaign and while he makes some good points I think he's on better form when doing the observatio I actually didn't realise before starting this that it was just a collection of newspaper columns. What this means is that it's probably best read in short bursts in the bathroom rather than all in one go. The columns are mostly what you'd expect from Mitchell. Mordant, slightly grumpy and contrarian, but sprightly and often laugh-out-loud funny. One rather heavy section deals with the last election campaign and while he makes some good points I think he's on better form when doing the observational stuff about the little absurdities of everyday life. Essentially I had my own views echoed back at me, in a slightly wittier way than I'd have been able to express them myself. Nothing surprising or challenging, but none the less enjoyable for that. This book is a compilation of David Mitchell’s articles written for his column in the Observer over the years (2009-2014). Many of them date way back before I even started living in Britain, so I studied them with a mixture of anthropological interest combined with some degree of bewilderment. These articles were originally written as a response to the then current events, which by definition makes many of them obsolete in 2019, and that’s where the main weakness of the book lies. It is far from This book is a compilation of David Mitchell’s articles written for his column in the Observer over the years (2009-2014). Many of them date way back before I even started living in Britain, so I studied them with a mixture of anthropological interest combined with some degree of bewilderment. These articles were originally written as a response to the then current events, which by definition makes many of them obsolete in 2019, and that’s where the main weakness of the book lies. It is far from being the only weakness though. While some of these opinion pieces offered witty and relatable observations about the human condition (my favorite being about people who move to sunnier climes becoming less happy as a result), others were forgettable and dull. Much of the book would only be of any value only to the British, rather than a wider western or international audience. Finally, my god what is it with sentences that are so long-winded they occupy seven or eight lines and require the reader to go back to the beginning by the time they are done with it? David Mitchell is a familiar face and voice on my television when I want to watch some British comedy, and he sometimes appears on the Guardian online. This book is a collection of writing from various times, with added comments here and there, some lugubrious in that he admits when his observations or prognostications haven't been the best. The chapters are on particular topics and are themed well. It would probably better to see Mitchell as a social critic, one of the roles of a comedian or sati David Mitchell is a familiar face and voice on my television when I want to watch some British comedy, and he sometimes appears on the Guardian online. It would probably better to see Mitchell as a social critic, one of the roles of a comedian or satirist. He writes well, has a sharp wit and an eye for the absurd and ridiculous, particularly in the political sphere. Not all his ideas and comments come off, but that's to be expected. A hit or miss collection of columns. Some had me laughing out loud, such as the indignity of teaming up with the French on national defense or the wretchedness of Banks, but just as many times my illiteracy with the books' very specific Britishness left me lost. I mean, I know it's prime ministers, but as soon as we're left with zingers aimed at shadow secretaries, I'm a goner. Still, good insights are peppered throughout. This was an interesting read in 2019 as it was focused on the financial crisis of 2012. But, I really enjoyed it and it was an insightful read as we battle continuously through the political situation of Brexit. At times, he goes just a little far but his observations and commentary about modern Britain make for an engaging and, at times, laugh-out-loud read. Abandoned at 36% — just too much British politics circa 2010, but does have its moments. Sadly, not what I’m in the mood for circa 2018. I might skip ahead in search of more of the good stuff but won’t count it as finished. Mildly amusing but I got a bit bored. In my head I said that with David Mitchell's voice. A collection of Mitchell's newspaper articles. Occasionally amusing, but overall not a book I'd recommend to others. I have to confess, I didn't and don't actually have an issue with this book, I believe the issue here is with myself. I enjoy David Mitchell's line of work; he is a wonderful and humourous comedian with lots of life experience and a life slightly different to my own, especially in his past and how he was brought up, so he brings a good amount of topics and differences to the table, but what I was looking for in this book, humour, was really taken up with a tad too much moaning and criticising of I have to confess, I didn't and don't actually have an issue with this book, I believe the issue here is with myself. I enjoy David Mitchell's line of work; he is a wonderful and humourous comedian with lots of life experience and a life slightly different to my own, especially in his past and how he was brought up, so he brings a good amount of topics and differences to the table, but what I was looking for in this book, humour, was really taken up with a tad too much moaning and criticising of the world. Don't get me wrong, the book does warn of this, it is essentially David Mitchell moaning about the modern life, but I had hoped that this moaning would at least be humourous in parts, even really enjoyable, yet it wasn't. I've read other books by comedians, Jon Richardson's It's You, Not Me, is the perfect example of a novel that gets messages across in a humourous way, but sadly, Mitchell's style passed me by, leaving me to abandon reading at 20%. Sort of a summation of some of David Mitchell's articles as featured in the Observer newspaper, he annotates them and (quite possibly) edits them. I'm unsure as to the specifics, but that's not particularly a bad thing. As one would expect, the mini-essays in this book are on a variety of topics, though most of them could be described as "British". It is an enjoyable book for its humour and scope; no fan of Mitchell could deny that it is definitely him speaking. I enjoyed his opinions and style o Sort of a summation of some of David Mitchell's articles as featured in the Observer newspaper, he annotates them and (quite possibly) edits them. I'm unsure as to the specifics, but that's not particularly a bad thing. As one would expect, the mini-essays in this book are on a variety of topics, though most of them could be described as "British". It is an enjoyable book for its humour and scope; no fan of Mitchell could deny that it is definitely him speaking. I enjoyed his opinions and style of writing and found most things to be very interesting, even, dare I say it, thought-provoking. I would suggest it is more of a dip-in-and-out book rather than something you read all the way through in one (or a few) sittings, much like a newspaper is issued periodically as opposed to at the beginning of the year. It is funny, at times quaint and very much David Mitchell. It's a collection of columns previously published in The Observer, but as I don't live in the UK and therefore have not been in contact with said paper, all was new for me. This was the first I actually read by David Mitchell (not to be confused with the author of Cloud Atlas, The Thousand Autumns of Jacob de Zoet and more recently The Bone Clocks). I've seen/listened to him on a number of BBC shows though. And liked it. If you did as well, I think you'll enjoy the book too. I really enjoyed this book, and David Mitchell is incredibly intelligent comic gold (and if you've devoured all of Peep Show and That Mitchell and Webb Look, as I have, you can actually hear his voice in your head as you read, like an extra-funny unexpected audio book). As an American, though, several of the topics were too specific for me. The political tiffs of Britain circa 2009-2013 usually weren't things I could relate to, so I wound up starting--and eventually skipping over--about a third I really enjoyed this book, and David Mitchell is incredibly intelligent comic gold (and if you've devoured all of Peep Show and That Mitchell and Webb Look, as I have, you can actually hear his voice in your head as you read, like an extra-funny unexpected audio book). As an American, though, several of the topics were too specific for me. The political tiffs of Britain circa 2009-2013 usually weren't things I could relate to, so I wound up starting--and eventually skipping over--about a third of the essays in this book. Of course the fact that the topics weren't always something I knew about isn't the fault of Mitchell or the writing. That's just a "fair warning" consideration for American readers. ***An ARC of Thinking About It Only Makes It Worse by David Mitchell was generously provided to me via NetGalley in exchange of honest review. To be honest with you, I have never heard about David Mitchell before. I'm not familiar with American comedian other than the obvious one, such as Ellen or.. Heck, I don't know, okay? I only know Ellen. Haha. Even though I know some, I don't know that in American they call them comedian. I guess I know them as actors or hosts. This book is not as witty or ***An ARC of Thinking About It Only Makes It Worse by David Mitchell was generously provided to me via NetGalley in exchange of honest review. This book is not as witty or funny as I thought it's going to be. Surprisingly, it's smart and made me nods in agreement. I enjoyed the style of writing too, simple and understandable. This book is full of reasoned but amusing opinions rather than outrageous statements seeking the quick spotlight of attention used by some columnists. It has lots of bits of history scattered like confetti. It’s a calm book but certainly not a dull book. It’s a good analysis of what we, as a society, have been concerning ourselves with for the past six years or so, a nice glance back over our shoulder with a wry shake of the head from side to side. It’s entertaining, informative and very funny w This book is full of reasoned but amusing opinions rather than outrageous statements seeking the quick spotlight of attention used by some columnists. It has lots of bits of history scattered like confetti. It’s a calm book but certainly not a dull book. It’s a good analysis of what we, as a society, have been concerning ourselves with for the past six years or so, a nice glance back over our shoulder with a wry shake of the head from side to side. It’s entertaining, informative and very funny when imagining things that might happen. It has a sort of sideways optimism which I found charming. Great, just great! I really like David Mitchell's self-deprecating style of humour, so buying this book was a no-brainer! I was slightly disappointed that it's a collection of newspaper pieces he's written but I needn't have been. After all, I never read the originals so it was all new to me! Most enjoyable and quite often laugh-out-loud funny. Best read in small doses, I think, to avoid becoming jaded with the format. Mitchell is a favourite of mine. His arguments are always hilarious but logical and incisive. This is a collection of columns he wrote for the Guqrdian and the Observer from 2010 to 2014. They are clever, funny and biting. They are also on a range of topics and if you try to read more than a few at a time, you may find yourself rather overloaded as I did. Best read in small doses, it's laugh-out-loud funny. David Mitchell is a British actor, comedian and writer. He is one half of the comedic duo Mitchell and Webb, alongside Robert Webb, whom he met at Cambridge University. There they were both part of the Cambridge Footlights, of which Mitchell became President. Together the du Librarian Note: There is more than one author in the Goodreads database with this name. See this thread for more information. David Mitchell is a British actor, comedian and writer. He is one half of the comedic duo Mitchell and Webb, alongside Robert Webb, whom he met at Cambridge University. There they were both part of the Cambridge Footlights, of which Mitchell became President. Together the duo starred in the Channel 4 sitcom Peep Show in which Mitchell plays Mark Corrigan. The show received a BAFTA and won three British Comedy Awards, while Mitchell won the award for Best Comedy Performance in 2009. The duo have written and starred in several sketch shows including The Mitchell and Webb Situation, That Mitchell and Webb Sound and most recently That Mitchell and Webb Look. Mitchell and Webb also star in the UK version of Apple's Get a Mac advertisement campaign. Their first film, Magicians, in which Mitchell plays traditional magician Harry, was released on 18 May 2007. On his own, Mitchell has played Dr James Vine in the BBC1 sitcom Jam & Jerusalem and Tim in the one-off ShakespeaRe-Told adaptation of The Taming of the Shrew. He also is a frequent participant on British panel shows, including QI, Mock the Week and Have I Got News for You, as well as Best of the Worst and Would I Lie to You? on each of which he is a team captain, and The Unbelievable Truth which he hosts. Regarding his personal life, Mitchell considers himself a "worrier" and lives in a flat in Kilburn.